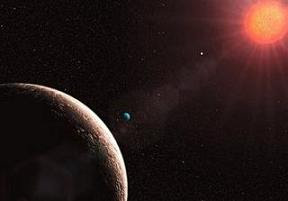 The Physics Groupie Blog: Exoplanets! I can't think of anything more exciting than to keep a close watch on the discovery of extra solar planets, so-called "exoplanets", planetary bodies circling other stars. It’s been a dream of astronomers since the early days of gazing up at the sky to find other Earth-like planets which may harbor life. Today’s exoplanet research is making this dream a reality, and soon now we’ll see an abundance of planets very similar in nature to Mother Earth. Although work to find exoplanets began as early as 1988, the first confirm discovery of an exoplanet was in 1995 with the detection of a 51 Pegasi b by Michel Mayor and Didier Queloz of the Geneva Observatory. Since that time, 369 exoplanets have been detected. There are a variety of methods used to find exoplanets. The first and most common is the spectroscopic radial velocity or "wobble" method that infers the existence of an exoplanet as its gravitational pull makes the star move towards or away from Earth. Another popular method used today is the transit method where the brightness of a star diminishes by a small amount as a planet crosses in front. About one quarter of the exoplanets found so far are so-called "Hot Jupiters," planets whose mass is close to or exceeds that of Jupiter and orbits very close to the host star (0.05 astronomical units, where AU is the distance from the Earth to the Sun). The recent discovery of WASP-18b is a great example of a Hot Jupiter, 10 times the mass of Jupiter, and orbiting at a distance of just 0.02 AU. The orbital period (time it takes to circle its star) is only 22 hours. Just imagine something that large whipping around a star that quickly! WASP-18b is even more unusual because it is going to crash into its star in about 1 million years. The smallest exoplanet to be discovered thus far surfaced in September 2009. Named CoRoT-7 b, it is the first rocky planet found outside our Solar System. It has a density similar to that of Mercury, Venus, Mars and Earth making it only the fifth known terrestrial planet in the Universe. Its star is a solar-type star at a distance of 150 parsecs from Earth. CoRoT is a space mission led by the French national space agency, CNES. I like to monitor all the recent exoplanet discoveries by checking The Planetary Society's Exoplanet Catalog every few weeks. It can be a fun family activity to have the kids check the list on a regular basis. That way little Catherine can say "Hey Dad, they found another Super Earth today. I'll tell you all about it at dinner tonight!"